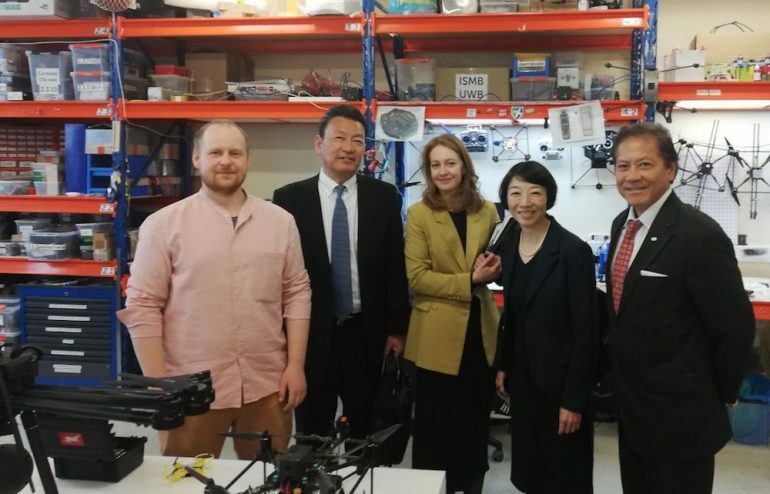 The meeting of Tsuru Robotics CTO Nikita Rodichenko with the heads of Japan Management Association (JMA) — the Japanese Association of CTOs, took place in Skolkovo. The JMA delegation arrived in Moscow to study Russian companies and select interesting ones for cooperation with Japanese firms. The meeting took place in preparation for the visit of a group of Japanese companies technical directors to Skolkovo in autumn. The JMA delegation visited Tsuru Robotics laboratory. We made a presentation of our company, talked about the projects that we are currently working on, and agreed on further cooperation with JMA. Exhibition hall Manege held the fourth international exhibition ARABIA-EXPO. Arab countries, Russian regions, and Russian and Arab companies participated in the exhibition. 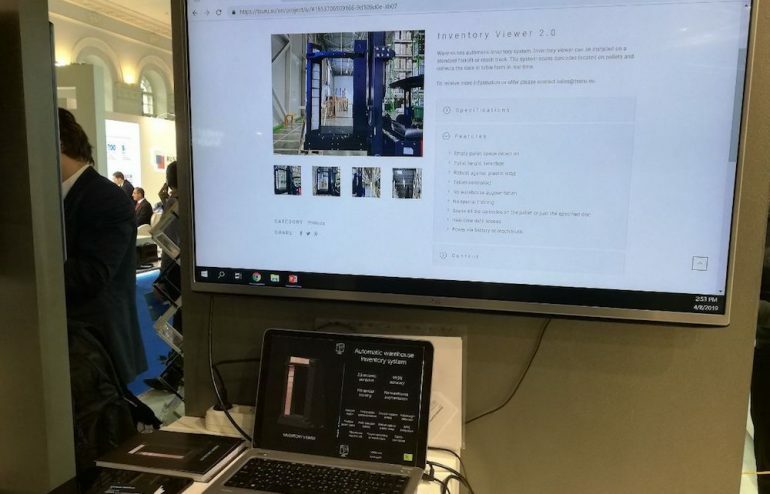 Tsuru Robotics presented its automatic warehouse inventory system as part of the joint Skolkovo booth. The system scans barcodes located on pallets and enters data into the table in real time. The first company to use our inventory system was “Mars”, a world leader in the production of pet food and a manufacturer of famous chocolate bars. Visitors of ARABIA-EXPO showed interest in our system. The German large IT company SAP, a manufacturer of software for organizations, held an innovative day “Evolution of customer experience in the segment of fast-growing companies” in Moscow, in which Tsuru robotics was invited to participate. One of the main topics of this event was the development of digital marketing, in particular, the introduction of new technologies in advertising. Tsuru Robotics CTO Nikita Rodichenko told about the drone shows created by the company, which have become a truly innovative product and arouse stable interest among advertisers. 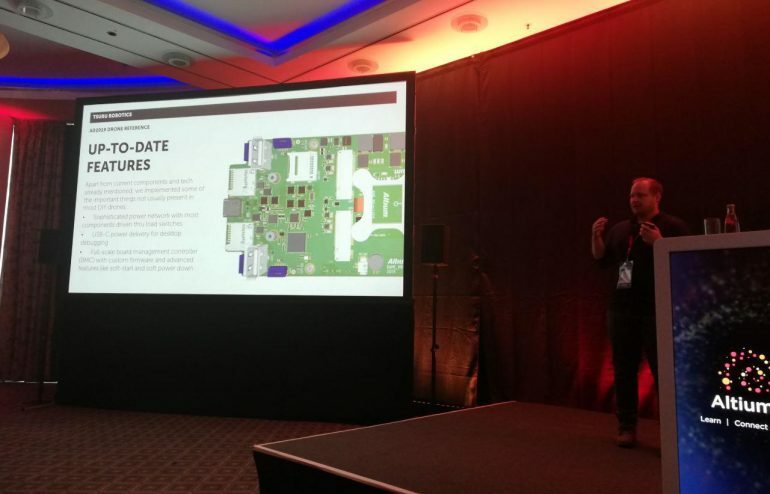 Altium, a leading developer of software for PCB design, held its annual meeting Altiumlive in Munich. This time Tsuru Robotics participated in it, demonstrating a reference design of the drone created in the Altium Designer program. Nikita Rodichenko, Tsuru Robotics CTO, presented our work at Altiumlive. The center for contemporary art Winzavod hosted the II Russian-German forum of creative industries ART-WERK 2018. Panel discussion “Innovation blurs the boundaries: the place of creative industries in the world of technology” opened the forum. 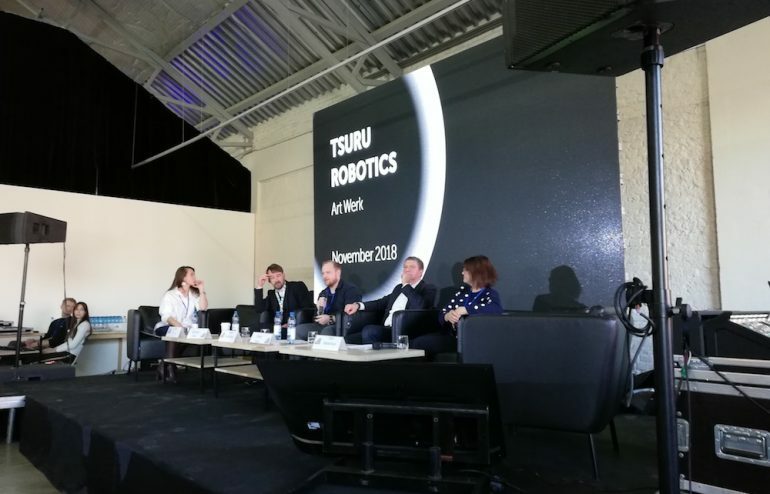 Tsuru Robotics CTO Nikita Rodichenko participated in the discussion. 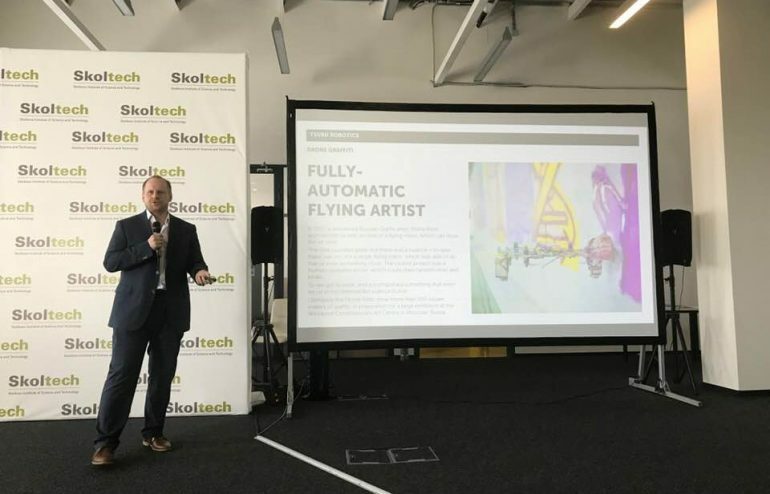 He spoke about the company’s projects in the event industry, as well as the integration of technology and art, which is represented by our first graffiti drone in the world. The head of the Saxon center for culture and creative industries Christian Rost, Director of Hamburg Kreativ Gesellschaft mbH Egbert Ruhl and head of the Design and Technology projects of the British higher school of design Vera Baklashova also participated in the discussion. Skolkovo hosted another Skoltech Industry Day, an event dedicated to Skoltech’s mutually beneficial cooperation with various companies. Tsuru Robotics CTO Nikita Rodichenko gave a speech at the opening plenary session. He said that the company was founded by Skoltech students a few years ago, and now Tsuru Robotics itself contributes to the students training. This summer four students of Skoltech implemented three projects in the company. Tsuru Robotics will continue such mutually beneficial cooperation with Skoltech. Representatives of “Gazpromneft”, “Phillips” and other companies also participated in the opening of Skoltech Industry Day. 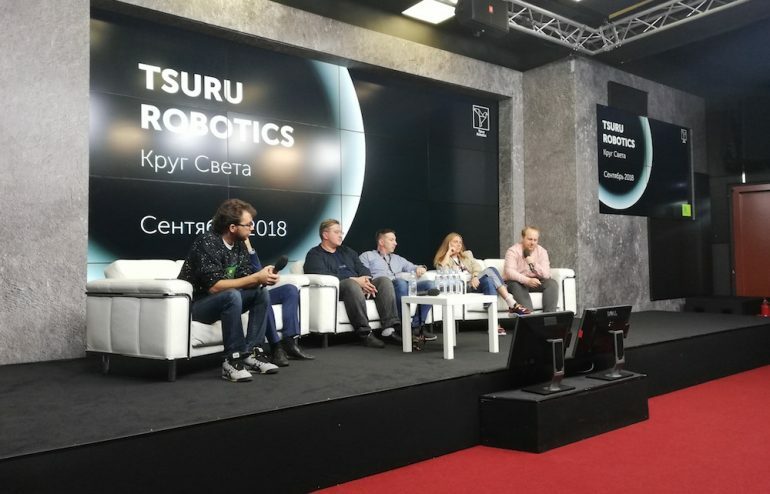 Tsuru Robotics CTO Nikita Rodichenko participated in the discussion “Creation of light shows with the use of flying machines” that happened within the framework of the Moscow international festival “Circle of light”. He spoke about the strategic objectives of the company, as well as about two projects related to lighting solutions – drone show for X5 Retail Group and EcoBall presentation. 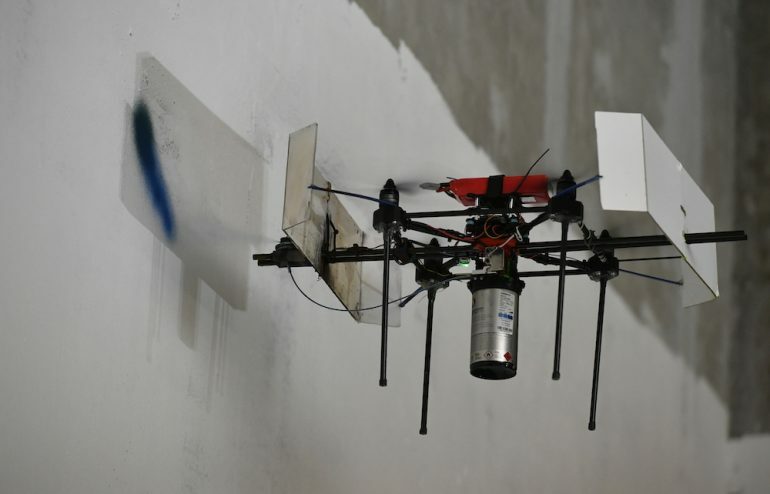 The story about our graffiti drone also attracted attention of the listeners, even though it did not relate directly to the topic of discussion. The representatives of Intel and DroneSwarm, as well as multimedia producer Ekaterina Rezvova also participated in the discussion. Our mini-quadrocopter assembly kit Nanopix is gaining popularity. The company Minibot held two master classes on assembly and control of devices, each of which was attended by more than 50 people. 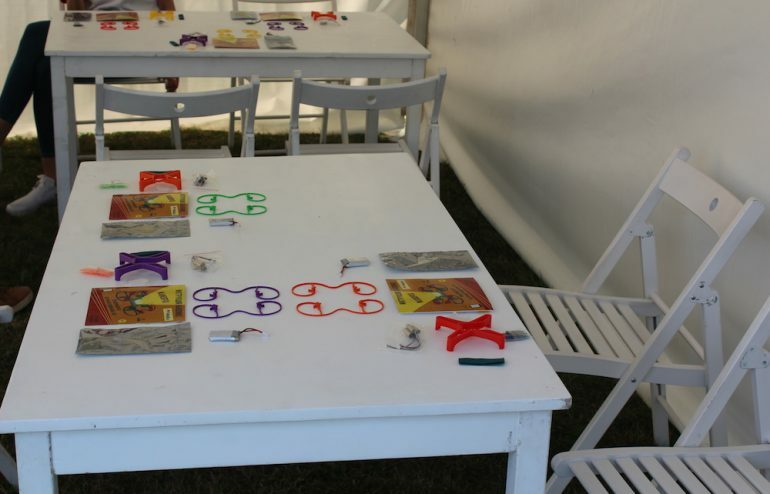 The first master-class happened in the framework of the already traditional famous open air science festival Geek Picnic, dedicated to modern technology, science, and creativity. The second one took place during the celebration of the 20th anniversary of the Russian company ABBYY – the world’s leading developer of text recognition programs. Moreover, for this particular master-class, Minibot built a unique race track where people could try their hand at managing Nanopix. 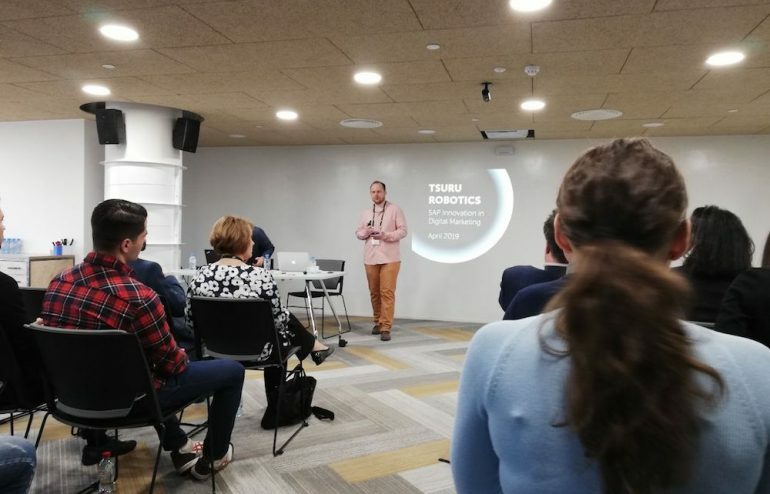 Tsuru robotics together with Space CREI and Laboratory of intelligent space robotics organized an Open Day about the Masters and Postgraduate studies in Skoltech. Nikita Rodichenko, Skoltech graduate and CTO of Tsuru robotics, told how recent students managed to build a technology startup and develop it into a large company, which, in 3 years, has produced 181 unmanned aerial vehicles and has established an independent development of almost all used electronics (flight controllers, navigation systems, radio modules and power management systems). 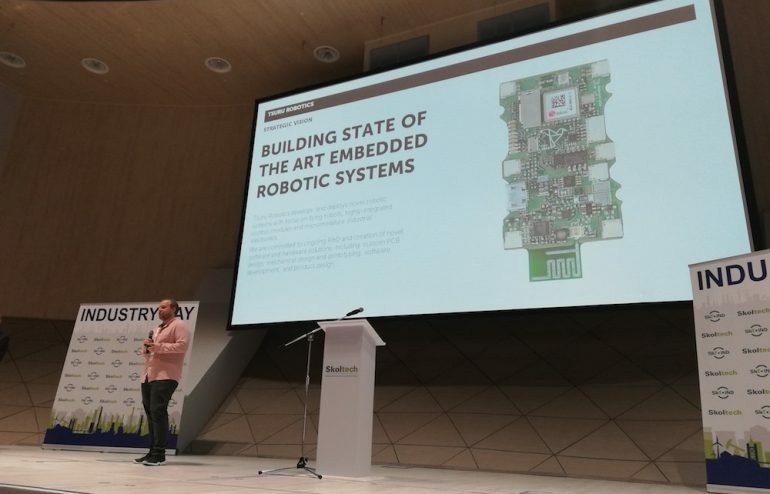 Dzmitry Tsetserukou, head of the Intelligent space robotics laboratory at Skoltech, and Pavel Krivozubov, head of the Robotics and AI department of the Skolkovo Foundation also spoke at the Open Day. The photo is from Dzmitry Tsetserukou Facebook page. 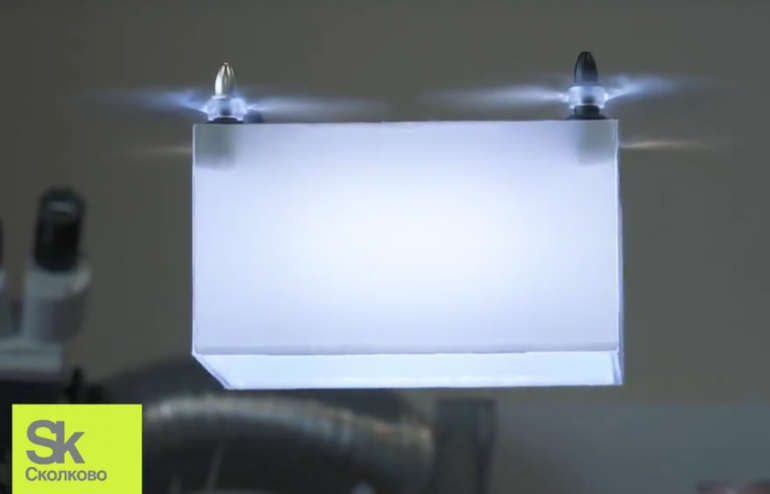 drones (20 cm diagonal) with scattered led lighting participated in the show. Specially created video three walls projection accompanied the performance. Music also was designed purposely for the 2.5-minute show. Besides, for the first time, the positioning system cameras were located on the same line, not just in the same plane. Skoltech-Tsuru Flying Arena, opened in Technopark, is the largest Russian indoor flight zone for unmanned aerial vehicles. Skolkovo Technopark provided the space for the zone. The area of SxT Arena is 260 sqm, ceiling’s height is seven meters. This Arena with the preinstalled local positioning system is located on the ground floor of Technopark. The arena is a training zone, where, in addition to testing algorithms, you can conduct a variety of rehearsals for different types of drone group behavior. We’re developing new types of drones group behavior in the Arena in collaboration with Skoltech ISR Lab. In addition to current work, Skoltech ISR Lab and Tsuru robotics will conduct summer practice for students. Students will be able to participate in the implementation of the company’s projects, or carry out their own, gaining practical knowledge and skills of drone control. We successfully implemented our latest project — a mobile show complex for the company FabFuture. The complex can be installed for advertising purposes in areas with large concentrations of people — in shopping malls, airports, etc. 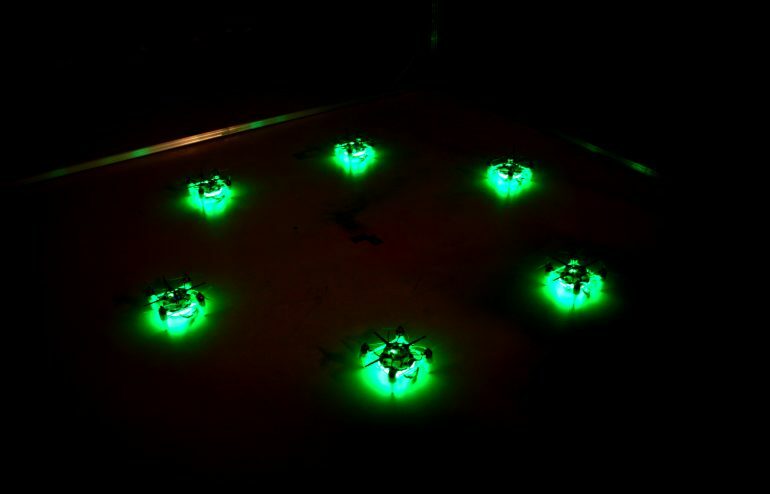 Six drones automatically perform a specified mission within a limited space. The frame, inside which the drones fly has a cubic shape. The diagonal dimension of the drones is 250 mm, and frame size is 3 m. After completing the 7-minute flight program, the drones land and are ready for takeoff again after quick batteries replacement. Show complex includes drones, camera positioning system, frame, and computer. The whole system takes three to four hours to build and configure. The customer plans to hold shows in different Russian cities. More information on project page. 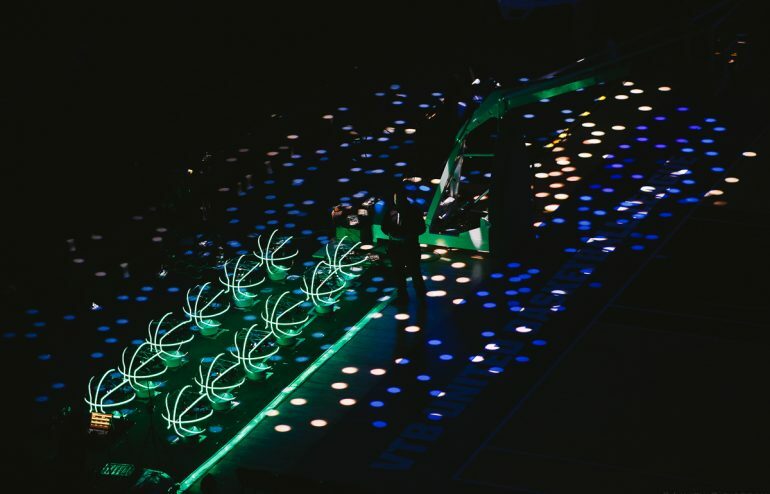 Our company in collaboration with Interactive Lab and “Pitch group” presented one of the show programs during the match of all stars of the VTB United League in St. Petersburg. Our devices broke at least the same amount of applause from the audience, as the best Europe basketball players in the “Yubileyny” sports Palace. Tsuru Robotics is the only company in Russia that creates autonomous drone shows while constantly improving the program. For the first time in our country, a group choreography of 12 drones was carried out. The vehicles started the show during the time-out between the third and fourth quarters of the main match and performed more than three-minute “dance”. Large drones were “dressed” in costumes, stylized as basketball balls. SIBUR and Wilson designed “Ecoball” – basketball balls made of orange-and-blue recycled plastic specifically for this match. Led lighting costumes of drones, shimmering, repeated these colors. Anton SOLOMIN, a basketball columnist for “Match TV”: “It was terrifically beautiful and even a little scary! The rise of the machines has never been so close. This show was really unexpected for most of the guests. The performance was, certainly, unusual – no one has seen this before”. More information on project page.